The Work Breakdown Structure is used to get a complete overview of the project and to define its scope before the start of the project. Unlike a network diagram, the work breakdown structure represents a view of the project that is independent of the time schedule. A work breakdown structure breaks the project down into its individual components (hence the term "Work Breakdown"): Project > Collective Activities > Activities > Tasks. This means that the project is divided into smaller, more easily manageable parts. For the subtasks, more precise time and effort estimates can be made and so the work and project processes can be controlled more efficiently. 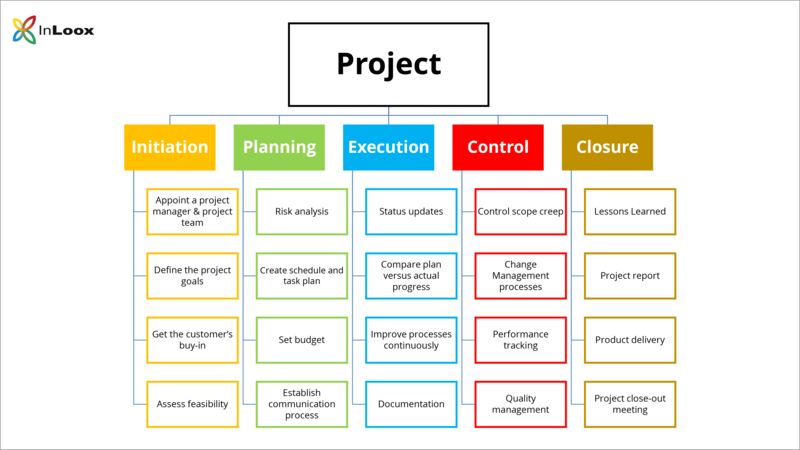 The completed work breakdown structure represents a project roadmap that provides the framework for the planning, controlling and monitoring of the project and thus forms the foundation for controlling deadlines, costs and performance (see Magic Triangle). No matter which method you choose, you should not break down the project too granularly, as this would complicate controlling the project. - A work breakdown structure is often created together with the project team, which enables a better cost and effort estimation and time it takes to complete tasks and increases project team's motivation and feeling of self-efficacy as they are actively involved in the planning. What is a work breakdown structure? • Copyright 1999-2019 © InLoox, Inc. All rights reserved.